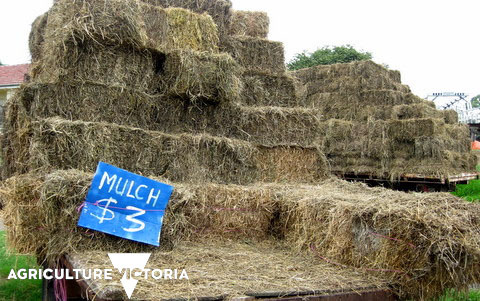 In recent years many areas of Australia have been impacted by heavy rains and flooding spoiling hay and crops, Composting has been found to have the greatest potential to return some benefit to the farm and this is the focus of this fact sheet by Declan McDonald, Kevin Wilkinson and Sally Stead from the Victorian Department of Environment and Primary Industries. Aerobic composting is the rapid decomposition of organic materials into a humus-rich product ideally suited to soil improvement. High temperatures are naturally generated during the composting process resulting in the destruction of any weed seeds and pathogens that may be present in the raw organic materials. If your farm produces sizeable quantities of ‘waste’ materials each year (e.g. spoiled hay, silage, manures etc. ), then composting is a good way of improving your soil and extracting extra value from what was previously often regarded as waste. Compost contains valuable nutrients and is rich in humus. Humus is long-lasting in the soil and can be beneficial in providing for improved physical, chemical and biological conditions. While there are numerous composting methods available, the most simple and cost effective for farmers is the ‘Turned Windrow’ method. This involves piling organic materials in correct proportions, and with adequate moisture, in rows on a suitable surface and then mixing well. The dimensions of the windrow depend on the types of materials being composted, the space available and equipment being used. For a manure-based operation, the height of the windrow will be typically around 1.5m, with the base at two to three metres wide. The length of the row can be as long as space permits (Figure 1). Many farm wastes (e.g. manure, hay, silage, sawdust) can be composted with minimal pre-treatment. Other wastes that become available from time to time (e.g. woody wastes) may need to be chopped up because they are too coarse. Once the wastes are correctly mixed in the right proportions, and at the right moisture content, the composting process will begin. Composting is a biological process, carried out by microorganisms that are naturally present in the environment – so no special inoculants are required. All you need to do is provide organic materials in the right proportions, with moisture, and the microbes will do the rest!